Northern Ireland manager Michael O’Neill was left to rue a “cruel” exit from Euro 2016 after an own-goal, as well as some perceived time wasting from Wales, ended his side’s journey. O’Neill’s side had already defied the odds to line up in this all-British last 16 clash but were good value throughout the narrowest of 1-0 defeats, edging the play for extended periods without creating clear-cut chances. Wales suffered similarly in the final third but took the spoils - and a historic quarter-final against Hungary or Belgium - when Gareth Bale’s teasing cross was prodded over the line by Northern Ireland defender Gareth McAuley in the 75th minute. For O’Neill, for their superb travelling support and for the passionate McAuley it was a bitter denouement to the nation’s first major tournament in 30 years. “I felt it was a very tight game. It’s just a very, very cruel way to lose the game,” he said. “We didn’t deserve to lose the game...certainly with that nature (of goal). “Not many people gave us any chance of doing anything in the tournament but we came within a whisker of getting to the last eight. I don’t think it would have been undeserved had we got that. “It’s difficult to quantify and reflect on the tournament as a whole at this minute, but the players have been tremendous in their effort, their commitment, their pride in playing for their country. While rightly proud of his side’s efforts in France - they won one game from four but proved resilient and well organised throughout - O’Neill was unhappy with what he perceived to be sharp practice from Wales in the closing minutes. A few minutes after taking the lead skipper Ashley Williams collided heavily with team-mate Jonathan Williams, with both men hitting the deck. 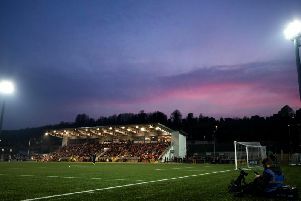 Northern Ireland were in the process of building an attack at the time but were frustrated when English referee Martin Atkinson blew to stop play. O’Neill claimed the Welsh coaching team had shouted at the central defender to force the halt in play and suggested the time added on was insufficient. “I was disappointed towards the end in terms of the time wasting and I felt the referee could have handled that better,” he said. “The dugout told him to sit down on the pitch. Ashley Williams sat down on the pitch. “It’s the first time I’ve seen that in my life, that a player is allowed to stop play by sitting down on the pitch. If there was an injury and the player could leave the pitch why did that not happen? As for McAuley, whose outstretched leg only prevented the waiting Hal Robson-Kanu finishing the job from close range anyway, O’Neill had two messages: first that he is not to blame and second that he wants the 36-year-old to play on. “I’m not going to point the finger at him. I’m not going to blame him in any shape or form,” said the manager. “He had a split-second decision to make, unfortunately it went against us. “Gareth has not only had a great tournament he has been great for me over the last four years.